Get ready for the next crochet a long to be launched on The Knitting Network- the beautiful Folk blanket. The gorgeous yarn colour pack can be purchased now, ready for the first pattern launch next Friday, 9th March. For just £13.99 you will get a beautiful colour pack which contains 8 x 100g balls of Stylecraft Special DK yarn. This CAL is in two parts, and allows you to crochet at your own leisure, but still share your progress with fellow crocheters over on The Knitting Network's Crochet-a-long Facebook page. As well as sharing tips, asking for advice and sharing any queries you may have. This versatile blanket will brighten up any living area, great as a lap blanket or a throw for your bed. Great for adults and kids, this blanket is suitable for all. This pattern is beginner level and suitable for all abilities. The blanket measures 84 x 84cm and is made up of a series of classic granny squares, using treble stitches and chains. Once you've mastered the pattern you'll be away with crocheting your very own masterpiece! There are 36 different colour ways. 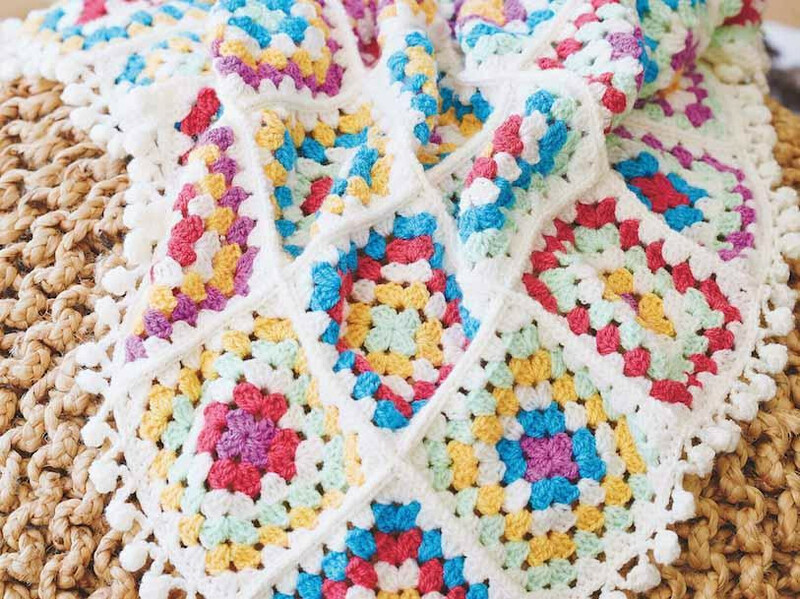 Crocheting granny squares is very relaxing and satisfying, so this blanket wins all round! Once the squares are all joined together, you can add the adorable pom pom edging. Inspired by Folk stories, this lovely blanket has colourful middle sections, bordered with white yarn giving it a crisp finish. Purchase your exclusive yarn pack, grab your crochet hook and start making your very own Folk Blanket! The first part of the free pattern will be released on Friday 9th March, in time for you to get your colour pack and clear some space in your diary for a crochet weekend!